Kill the Irishman – 3/5 – Movie Reviews by Ry! 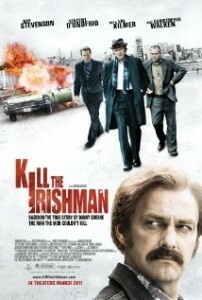 Kill the Irishman – 3/5 – This is a review for a blu-ray released film. This film is one that I have been looking forward to watching. The main reason for my eagerness is because it’s a gangster film. Gangster films are a dime a dozen in the movie industry, but great ones (Goodfellas, Casino, The Departed) are hard to come by. When it comes to this film, it doesn’t quite live up to the hype of all its critical praise, but overall, Kill the Irishman is a film that will entertain for the most part. Premise: This is the true story of Danny Greene; an Irish thug working for mobsters in Cleveland. During his time (1970s), you will get to see how his influence will have consequential effects on things to come in his rise and fall journey. In the main role of the Irish gangster Danny Greene is Ray Stevenson. In this role, he does a decent job in recreating this infamous gangster from Cleveland. A lot of what makes this character intriguing to watch on screen is because he does a good job in embodying strength and a flaw within one quality; pride. Danny Greene is a very arrogance, stern individual, one that prides himself in his street knowledge and his power to help people. In doing this, Stevenson provides both the physical and suave tone of what a standout individual Greene was, even though he dealt with the Mafia. In it all, he creates this fragile balance for a character, helping to harmonize some emotional situations that will bring you to either care or loathe his persona. Outside of Ray Stevenson, the rest of the cast acts out very common characters within the film. Each are pretty much cliché to a gangster themed film. You have your typical hired guns, aloof and loyal henchmen, love interest, and generic cops. Some names you will recognize in the film are Vincent D-Onofrio, Val Kilmer and Christopher Walken. They do average jobs in their supporting roles, but nothing more than that. The direction of this film is very basic. The flow of this film has a very standard progression, chaining events for a very broad stroke of the beginning, middle and end. There is no divergence from this singular focus, which detracts from the films overall story and theme. The detraction creates a lot of lethargic feelings during the film. With it being a gangster style film, there should be a strong focus on the character performances and dire dramatic sequences. In the beginning, we get introduced to Danny Greene. In this prologue and the first half, the film focuses on his early life as he rises up the ladder of the mafia controlled syndicate in Cleveland during the 1970s. Everything here (along with the standard direction) is infused with a chronological perspective; linking ‘important’ scenes at a very fast pace. This creates that ‘lethargic’ feeling, where importance is never really brought to the forefront. Once we get this general buildup out of the way, we begin to get a hint at this individual and what makes him tick. As the film fast forwards four years, as the film continues to detail Danny Greene’s further rise in the mafia. From this part of the film till the end, you get every cliché scene and quip you would find in every other cliché element. Nothing is original, but you always seem to stay focused because you know all that is being depicted has some relevancy because of it being based on ‘true events’. What also helps this film from falling off is that even for the direction, the second half of the film slows down it’s pace, causing you to actually see some deep characterization of Danny Greene. This helps you see what is involved with his personal and business life, and see when certain decisions are made, how they have a very strong aftermath effect on the city and the mob. The context of the film starts to have some relevancy, but because of the generic direction, the film continues to juggles with the mediocre line. Once we get to the end, it is very underwhelming but still strikes some poignant accord. The visuals of the film don’t have a dramatic effect, but the re-creation of the 1970s Cleveland is done very well within an aesthetic appeal. Everything from the buildings, homes, to the overall gangster-esque scenes, you believe it to be true. The score is a bore in this film. The music does actually detract from enjoying the film at times. Overall, Kill the Irishman doesn’t re-invent the wheel, but it will entertain. If you’re a fan of gangster films and want to see something in this genre, check it out. This film is a rental at best. Nebraska – 4.5/5 – Movie Reviews by Ry! Labor Day – 3/5 – Movie Reviews by Ry!